There is a great Christian thought here. A man’s circumstances may be such that he cannot become a missionary or a preacher. Life may have put him in a position where he must get on with a secular job, staying in the one place and carrying out the routine duties of life and living. But where he cannot go, his money and his prayers and his practical support can go. Not everyone can be, so to speak, in the front line; but by supporting those who are there, he can make himself an ally of the truth. When we remember that, all giving to the wider work of Christ and his church must become not an obligation but a privilege, not a duty but a delight. The church needs those who will go out with the truth, but it also needs those who will be allies of the truth at home. What else to say? That each one, in his place, home, work, school, is also a Christian “adventurer,” light, influence, speaker for the Good News. It is good to support the proclamation of truth with our material means. It is also necessary that each of us be a goer, within the reach permitted to us. Some people say that the “go” of the Great Commission does not apply to all, that each individual cannot go into all the world. This is being ingenious. All of us can, and must, go to some part of the world. The first Christians did, Acts 8.4, and so must we. We may not be able to go across oceans to other continents, but we can go across the street to other homes. And then a prayer that comes, not from the Bible, but from somebody’s imagination. No Bible verse. No Bible proof. No Bible citation. Just somebody’s made-up prayer. Strange, isn’t it, how people claim to tell you what the Bible is saying, and then when it comes to explaining how to be saved, they drop the Bible altogether? The Bible has plenty to say about how to know God, how to accept Jesus’ gift of forgiveness and eternal life. But there is no prayer in the Bible like the one published on the page. The Bible never, ever tells anybody to pray a prayer in order to be saved. There are very different answers, but the authors of the webpage prefer their own version of what to do. The same is true of Philip the evangelist, who was called “the evangelist” not merely because he was a passionate preacher, but also because he understood that God’s purposes were outward from Jerusalem, not inward to Jerusalem. By contrast, the apostles remained in Jerusalem, probably because they saw the Holy City as the center of God’s end-time universe (52). Barnett continues: “The notion of Jerusalem as centrifugal and not centripetal in God’s mission to the nations, which became so much associated with Paul, had its seeds in the vision of Stephen and the activities of Philip” (53). We do ourselves a huge disservice when we treat the church like the business world. It is the utmost folly to appoint business men who have little spiritual content in their life to the eldership or the deaconate. Don’t get me wrong; a spiritually minded man, who is also a businessman, may do well in the eldership, or as a deacon, but many times we look at a man’s business acumen and fail to discern his spiritual qualities, or lack thereof. The church is not a business, and it should not be. What happens when the eldership and the deaconate become filled with unspiritual business men? We become results oriented. We measure things by the bottom line. Picked up again tonight on our Bible readings at the gym, started at 10 pm, after the last person finished her workout. (I was next-to-last.) We had six people present, not bad considering we’ve been out for two months. Four of the six are not Christians according to New Testament teaching. In two weeks we’ll have another. So, yeah, me in gym clothes, sweaty, teaching at 10-10.30 pm. Better than it sounds. 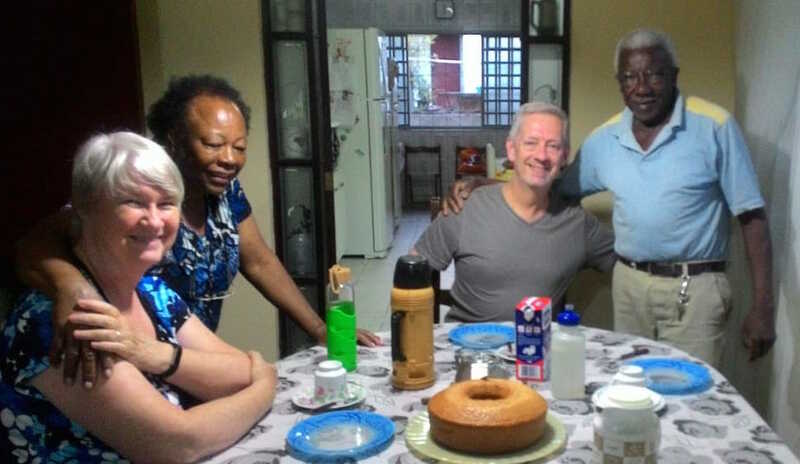 Vicki and I sat down with the parents of our neighbor Paulo this afternoon, and with a family friend who was staying with them while recuperating from pneumonia. Paulo was also present. I presented a lesson about Jesus from John 1.1-18, with a two-page outline. Sr. Vicente and D. Georgina are very religious and committed to their tradition, so it will be a challenge as we present the gospel to them. D. Georgina prepared coffee and cake for us after the study. Paulo took the photo. They live on the east side of the city. We’ve had a good bit of contact with them through Paulo, as we’ve joined them in cookouts, watching the World Cup, and other get-togethers at his house. Christian obligation. Gaius gave travel assistance to some fellow believers (though they were “strangers” to him), III John 5. These itinerant preachers had mentioned his goodness while visiting John, III John 3. So the venerable apostle asks Gaius for another favor. “Send them on their way” in a manner that God would approve, III John 6. These traveling evangelists were worthy of such help because “it was for the sake of the Name that they went out,” III John 7. Christians have an obligation to underwrite the work of those who minister the word, I Corinthians 9:7-12a. Focus question: Am I going, letting go, or helping to go? Textual note: NLT translates “brothers” as “traveling teachers,” vv. 3, 5, 10. Quite interpretative, but they were indeed traveling evangelists, what we today call missionaries. Let us see this projection as opportunity to preach the gospel to a growing number of people without any religious affiliation. “We are just as obligated to make our lives attractive and beautiful to others as we are to make them pure.” —Guy N. Woods, on 1 Pet 9.12.